→What is The Best Garden Gloves for Gardening? Know it here. A garden glove for gardening is a rubber or leather glove that protect your hands from harm. In summary, it is a protective gear that helps you do the dirty work fast and clean. Garden gloves come in different shapes and sizes. The most common garden gloves that you see that’s being sold in the market is the rubber glove. Rubber gloves are perfect for wet conditions because it is mostly waterproof. They are also hard to pierce because of its tough texture. Garden glove can be bought in different stores. You can find one in your local malls, gardening, and hardware stores. If you’re having trouble finding one in a store near you. We suggest that you order online because there are a lot of online stores that sell gardening gloves. Using gardening gloves is a big deal especially if you’re a professional gardener. And there are tons of benefits that you can get by using it. One of the most important factors of using gloves is that it doesn’t get your hands dirty. Gardening could sometimes be a dirty job. This is especially true if you make your own plant food made from compost. Compost contains thousands of bacteria that you make you sick upon contact. This is why gardening gloves are important to use. Gloves will not only protect you from dirt but from cuts as well. When your hand is protected with a garden glove you wouldn’t be able to feel the pain of getting cuts. You’ll be able to spare yourself from the life-threatening diseases. That could come in contact with your skin. To start things off we will first determine what are the different kinds of gardening gloves. Next is to know the qualities of a good garden glove and what kind of glove would suit you. And the different factors that affect the qualities of a gardening glove. ​Depending on the situation your garden gloves must match the kind of gardening that you’ll be doing. This is because each type of gardening glove has a specific purpose and advantages. The kind of glove that you’ll buy will affect your performance. ​The most common type of garden glove is the leather gloves. Leather gloves are perfect for thorny plants and dry soil. Next is the rubber gloves. This type of gloves is perfect for wet soil or wet conditions when farming. It’s waterproof so you don’t have to worry about it breaking. ​The uncommon gloves that you might encounter are the cotton gloves. This type of garden glove is usually used in picking up flowers. These are just some of the many classes of gardening gloves. Before you make your purchase, always ask assistance from your local store. ​Next on our list is the qualities of good garden gloves. What you need to look for is fairly simple, aside from the use of the garden glove. You’ll need to look for the durability of the gloves and what materials were used in making it. This is important because you don't want the gloves to break when you use them. Especially during times when you’re handling wet manure. The quality of your gloves should match the price that you’ll pay. Another quality of a garden glove that you need to look for is a comfort. Comfort should be given consideration because you will use it for long periods of time. Choose a glove that is comfortable to use so that you’ll enjoy gardening even more. ​There are a lot of factors that could affect the performance of your garden gloves. It’s important to know what they are because it will help you choose the right glove. These factors might be small if you look at it. But there’s a significant factor that affects its performance. ​The first factor that could affect the performance of your gloves is the size or fit. Having a loose glove will delay your work because it will keep slipping off your hands. And having a tight glove will be uncomfortable to use in long hours of work. ​Another factor that will affect your performance is the durability of the gloves. Cheap gloves will always break easily because the materials used are also cheap. Using the garden gloves daily will expose it to ordinary wear and tear. Holes and tears will form in no time if you buy cheap gloves. ​Gardening gloves are easy to buy. There are 3 key locations where you can find and buy your garden gloves. And these locations are your gardening shops, hardware store, and online shops. You can choose between these option to buy your gloves. ​If you’re new to gardening, we suggest that you buy your first gloves in a gardening shop or your hardware store. This is because you can actually see and inspect the product that you will buy. This will give you time to choose the perfect gloves for you. ​The most convenient way of buying gloves is buying it online. Online stores have all the brands and different types of gardening gloves for you to choose from. It’s a quick and easy way to buy gloves and you can pick from a huge selection of gloves. Now that you have an idea on what to look for in a gardening glove. 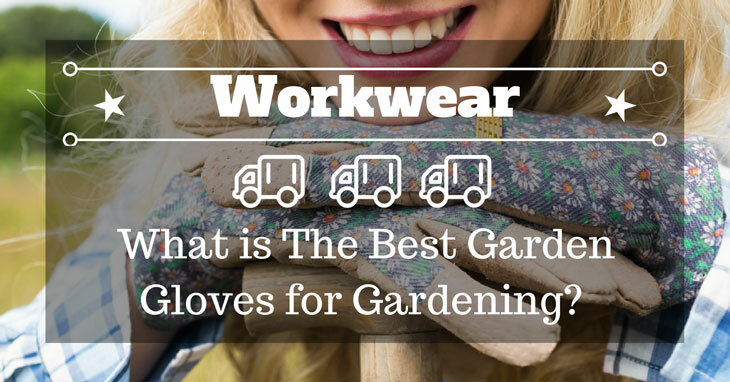 It’s time to know what’s the best garden gloves that are available on the market today. We’ve reviewed some of the best garden gloves for gardening that you might want to consider. If you’re looking for a synthetic leather that doesn't quickly puncture. Then the Thornproof Gardening Gloves by Magid Glove and Safety might be what you’re looking for. This gardening glove is perfect pruning thorny plants and flowers. The main feature of this gardening glove is that. It has knuckle gloves that provide extra protection. Sharp thorns can't easily penetrate the synthetic leather of this gloves. The extra coating will protect your hand from splinters and bruises. What makes this gardening glove standout is that it is very durable for a synthetic leather. Most synthetic leather that is manufactured gets punctured easily by small thorns. This product, on the other hand, doesn't get punctured easily. If you’re looking for a glove that can do well not only in gardening but in other fields as well. Then the Bamboo Working Gloves by Pine Tree Tools might be what you’re looking for. This garden glove can be used for both wet and dry situations. The main feature of this garden glove is that it can be used in any situation and not only gardening. You can use it for fishing or for manual labor. This is because the materials used in the making of this glove is of high quality. What makes this garden glove standout is that it’s made from breathable bamboo. This material helps your hands cooldown from stress and friction. It also absorbs bodily liquid such as sweat and perspiration. This will keep you working for long hours without having a problem with sweat. If you’re looking for a gardening glove that’s a genuine leather. Then the Leather Gardening Gloves by Exemplary Gardens might be what you’re looking for. This leather glove is ideal for general gardening tasks and other works. It has other features that are useful as well. The main feature of this gardening glove is that. It has a breathable spandex coating that gives your hand a nice fit. It’s also equipped with an adjustable strap so that you can adjust the tightness of your gloves. The leather skin keeps it from getting punctured by thorns and needles. What makes this gardening glove standout is that. It has a colorful finish that blends the color of the gloves to the soil. The color scheme doesn’t make the gloves dirty to look at. Instead, it blends the colors and makes it presentable to use. This makes it easy for you to clean and use. If you’re looking for a garden glove that works best for pruning. Then the Garden Genie Gloves by Sweetmart might be what you’re looking for. This durable garden glove is made up of flexible rubber latex. You can use it for pruning, gardening, and even hard labor. The main feature of this garden glove is that it’s puncture resistant even though it’s made up of rubber latex. Most latex gloves can be punctured by thorns and sharp branches but not this glove. It can be used for pruning the thorniest bush but it can’t be punctured. What makes this glove standout is that it has a built-in claw that could be used in digging. This might sound absurd but the claws really work. You can use the gloves to dig holes in your garden with ease. The claws are made from ABS-plastic that’s made to last even the toughest of soil. If you’re looking for an all-around glove that can be used not only in gardening but in other works as well. Then the Leather Work Gloves by KIM YUAN might be what you’re looking for. This glove can be used in almost any situation. The gloves are made up of authentic leather with high durability. The main feature of this gloves is its genuine cow leather material. The leather is very durable and comfortable to use. It also has a good grip because the palm area is designed to have a thick layer of extra gripping power. What makes this product stand out from the other gloves is that it has a wide range of application. You can use it in any way you like without having to worry about it. Its leather design can withstand high pressure and puncture. It can last long even if you use it daily and in heavy duty work. Stitching might loosen over time. Looking back at all of the brands we have featured there is only one brand that stood above the rest. And that garden glove is the Leather Work Gloves by KIM YUAN. This leather glove has what it takes to become the best glove for gardening. FULL GRAIN COWHIDE 100% Genuine Leather - Made from carefully selected high-quality cow leather with thickness depth above 1.2mm which is not only thick and sturdy but soft and supple. 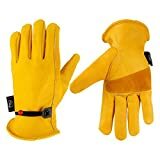 If you have any type of outdoor tasks to do these are the gloves to get, they are both comfortable and rugged enough that you only need one pair, and it will last long. COMFORTABLE & FLEXIBLE TO WEAR The cinch around the wrist to keep dirt and debris out, it also allows you to tighten on the gloves when you are lifting heavy stuff or loosen the gloves when you are pulling weeds to allow more breathability. WEAR-RESISTANT & ANTI-SKID Equipped with reinforced palm patch that gives you superior grip and skin protection. Stitched and double stitched with added layer of leather in palm where they always seem to wear out, so it can well protected your hands from the thorns, stickers and ripping of the vines it pulls. WIDE RANGE APPLICATION This glove features and excellent quality make it useful for Yard, Motocycle Driving, Gardening, Construction, Fence Fix, Trucking, Heavy Duty Work, Wood Cutting, Warehouse, Camping, Ranch/Farm, Landscaping, Diy, Garage, Moving, Welding, Grinding, Chopping, Mulching, Digging and any heavy or outdoor work. PROFESSIONAL MANUFACTURE Kim Yuan has more than 20 years of experience in the production of leather work gloves, so we know how to select High Grade leather and make High Quality working gloves, this gloves can well protected your hands, we are confident that these gloves can be compared with the similar gloves in the market. This is because when we look back at the qualities of a good garden glove. The Leather Work Gloves by KIM YUAN passes all of the requirements. This all-around glove is perfect for any gardening activity and other works as well. 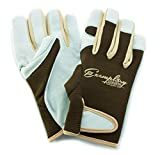 If you’re looking for the best garden gloves for gardening this 2018. Then you might want to check out this gloves.